Christophorus-Haus is a non-denominational, international students’ hall of residence with 145 inhabitants from all over the world. The hall is funded by the association „Christophorus-Haus e.V.“, through rental income, membership fees, and donations. Thus the hall is a private institution and independent from the Studierendenwerk Hamburg (formerly Studentenwerk Hamburg). 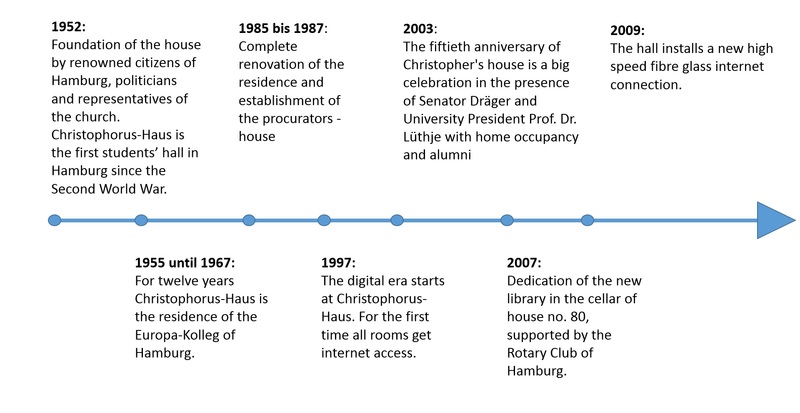 Currently, Christophorus-Haus has 147 residents, with a foreign population of 35%. Most of the 6 sqm. rooms were merged into 12 sqm. rooms and refurnished, kitchens and bathrooms mostly renovated, there is, as well, a gym, and a group workplace is being planned. Since it’s founding in 1953, once per semester, as a highlight of the house, a House Concert is put on, in which music students and amateur musicians are able to show off their skills.